The Nano Bible – something new or very old? 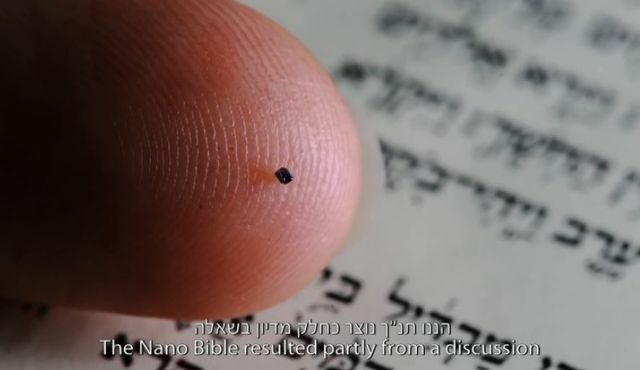 This is rather fun – The Nano Bible, the world’s tiniest Bible, is now on view at the Israel Museum. However, it can also tell us some interesting things about the use of the Bible past and present. Recently Cambridge University Library announced their success in securing Codex Zacynthius from the British and Foreign Bible Society. 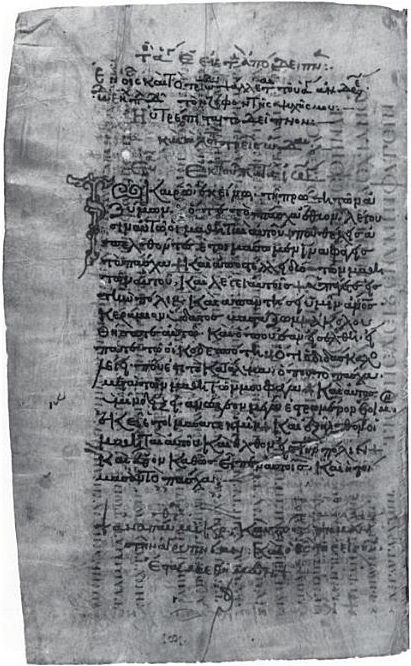 Codex Zacynthius (so called because it was ‘found’ on the Greek island of Zakynthos) was brought to Britain in the early 19th century and has been kept at the University of Cambridge since 1985. Ostensibly, the codex is a 13th century Gospel lectionary written on 176 leaves of vellum (treated calf skin) and has been accorded the lectionary number 299. A lectionary is a book containing portions of the Bible to be read at specific times in the Christian calendar. Ancient lectionaries, like Zacynthius, are helpful in biblical and textual studies as they provide evidence of any changes occurring in the text and the way in which those texts were used. This helps us to build a clearer picture of the way in which the Bible was transmitted and the texts used. However, what makes Zacynthius even more interesting is that it is also a palimpsest and contains a far older text. A ‘palimpsest’ is a manuscript that has been re-used (or recycled!). Parchment was an expensive commodity and therefore, even though a text was no longer useful or had become badly worn (the ink could fade, begin to cracked or simply be worn away through use), the parchment was often still viable. Therefore, the writing would have been erased (usually be scraping away the remaining ink) and re-used. This is the case with Codex Zacynthius. If you look at the image below you will be able to make out the original text (referred as the ‘undertext’) that runs sideways on. The undertext contains significant portions of Luke’s Gospel that include: 1:1-9,19-23,27-28,30-32,36-60,77; 2:19,21-22,33-3; 3:5-8,11-20; 4:1-2,6-20,32-43; 5:17-36; 6:21; 7:6,11-37,39-47; 8:4-21,25-35,43-50; 9:1-28,32-33,35; 9:41; 10:18,21-40; 11:1-4,24-33 running over 86 full leaves and 3 partial leaves. Although it is listed in the NA 27 as dating from the 6th century, David Parker (University of Birmingham) has more recently argued that the squarer and more compressed formations of some of the letters suggest a later date (possibly 7th century). This text has been allotted the letter Ξ and the number 040 and both its under and over texts are cited as witnesses to the critical edition of the Nestle-Aland New Testament Greek text (Novum Testamentum Graece). This is the Greek text used by most modern translators for producing new editions of the New Testament. WHY IS THE STUDY OF PALIMPSESTS INTERESTING TO BIBLICAL SCHOLARS? Palimpsests like Zacynthius can tell us a lot about how texts are transmitted (or reproduced) and we can see what types of text are being used in one particular place (for example, how different is the earlier text to the later one?) By studying how different families (or groups) of texts circulated we can build a clearer picture of their relationships to one another. Alongside its value as a relatively early witness to the text of Luke’s Gospel, the use of palimpsests within Christian tradition can reveal to us information about the reception of the Bible within different Christian communities. A pragmatic re-use of existing manuscripts (even those containing the text of the Gospels) appears to have been accepted and permitted. In fact, leaves from the wonderful and lavishly produced Codex Sinaiticus have been found being used to create bindings for later books. There also does not appear to have been a corresponding development of the Jewish tradition of Genizah – the prohibition of the destruction of objects viewed as holy (particularly sacred writings containing the name of God); for example, see Babylonian Talmud: Shabbat 115a.